T-Mobile is giving Galaxy S8 and Galaxy S8+ owners a weekend treat. Owners of the T-Mobile Galaxy S8 and S8+ are now receiving their Android 8.0 Oreo update. 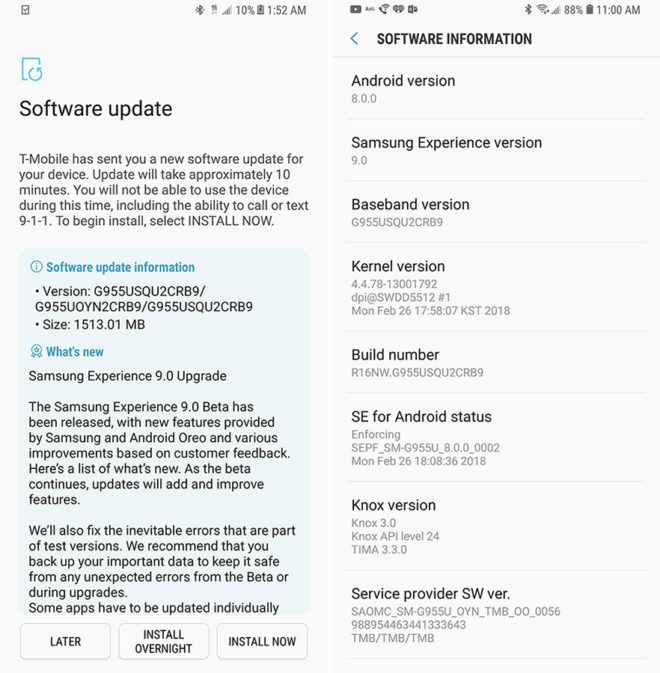 Several TmoNews readers began getting their update overnight, and they’re now on Android 8.0 with Samsung Experience 9.0. The Galaxy S8 update is 1548.94MB and is version G950USQU2CRB9, while the Galaxy S8+ update is 1513.01MB and is version G955USQU2CRB9. 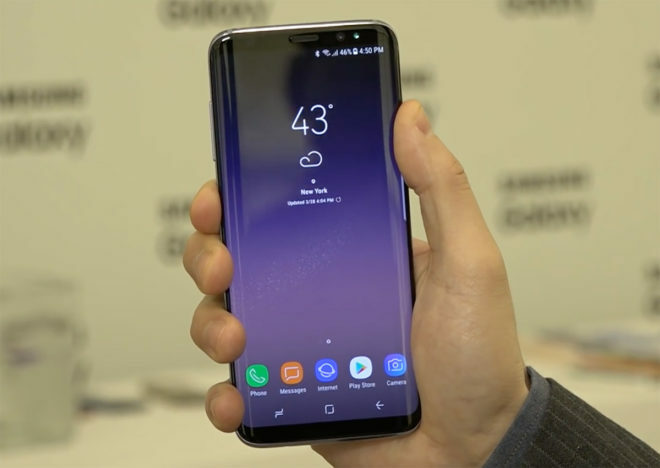 As for what’s included, you can expect Edge screen improvements like settings for better Edge panel visibility, more high contrast keyboard options for Samsung Keyboard, and new clock styles for the lock screen and Always On Display. The update to Android Oreo also brings features like autofill, picture-in-picture, and notification dots. The Android security patch level is at February 1, 2018. If you haven’t gotten this update on your T-Mobile Galaxy S8 or S8+ yet, you should see the OTA hit your device in the coming days. You can also check for it manually by going into Settings > Software update > Download updates manually. It’s exciting to see Android 8.0 finally hit the Galaxy S8 and S8+ on T-Mobile and give owners of those devices something new to play with during Galaxy S9 launch weekend. If you’ve got a Galaxy S8 or S8+ that’s been updated to Oreo, be sure to share your impressions of the update with us! Thanks, John, Wayne, Ryan, and Pyu! They are seriously making me miss my pixel, but something kinda expected and historically accurate if Samsung. If history repeats itself the active will get passed up until much later, and it will be the only major upgrade we ever get. Yeah, I just got the S8 Active at the end of February. Great phone but Android needs to take better control of updates. Need the option of just running a vanilla version. Stop complaining, you knew exactly what you were getting into when you bought a Samsung device. Never heard the term “the squeaky wheel gets the grease” huh? Seriously, does it get lonely all alone up on top of that soap box? STOP complaining about us complaining. You don’t like it move along. Bitching about something is our right, constitutional at that. Hey, it’s also your right so I guess we’re both wrong at this point and just need to drop it. You don’t like the way Samsung does things in regards to updates, it’s also your constitutional right to buy from a different company. Deny Samsung the money if you don’t like their practices. It’s really that simple. I’d respect the opinion if you didn’t just complain without doing anything about it. As I said, if you don’t like the practices of a company, buy from someone else. So, respect only with action? Dribble on good sir. Obviously your opinion is the only valid one to you. How do you know there has been no action? How do you know I haven’t written letters and the like about this? Honestly the keyboard commando thing is kinda old, isn’t it? Samsung is going to do what Samsung wants. Yes, yes buy someone else’s wares you say. Difficult when Samsung repeatedly builds better/more robust equipment then it’s competition. Will things eventually get better? I would like to believe so. Google has heard all our collective cries and is trying to implement ways around the foot draggers. Go ahead and sit back with your “better ways” I’m sure every time you read about someone that wishes Samsung would htfu you’ll continue to mock them. Hide behind your fake screen name. Although meh does explain A LOT. So at this point I again tell you to please have a great day. I’m sure your condescending words will brighten/enlighten someone’s day, somewhere out there. S8 active (both variants) passed WiFi alliance Oreo approval. So it will EVENTUALLY happen. Just FYI, I use an S8+ and I don’t mindlessly complain when the S8+ I bought didn’t get an update to Oreo until today. While I was happy, I didn’t feel the need because I was prepared going in that it was going to take a while for it to get the update. If you hate Samsung’s way of doing things, quit complaining splattering your BS on the Internet and tell people who actually have pull with Samsung if you want to continue using their hardware, or quit patronizing them. If you continue to do so, take some personal responsibility because it’s YOUR fault you’re not happy. I will continue to mock them, because they, like you, picked the one vendor that skins Android the heaviest, then complains. You not seeing the stupidity and lack of logic isn’t my fault. Get over yourself and buy a device that gets updated quickly if that’s what’s of utmost importance to you. I have been on Android and Samsung since the original note. I praise their hardware, but yes the software side is slow. I have never said hate, this is your wording. You need to stop twisting things to your liking and attacking people do to your own delusions of self grandeur. Seriously, your just repeating yourself over and over again. Hanging on to your one somewhat valid argument. I originally stated we are both wrong and right, to just drop it. Just like any other 13 year old girl you want to start personal attacks rather than drop it. To you I say have a great day, take care. Rejoice in knowing your safe behind your fake screen name and keyboard. I’ll continue to purchase Samsung products full well knowing they make the best hardware, but lack in staying on top of updates. Yes MEH I’ll continue to voice the fact that they take forever to release updates, and I’m sure you’ll be there ready to tell everyone how smart you are and how stupid they are. That’s why I sold mine for a OnePlus 5T. I’ve had Oreo since late January. Cool. I’m glad you got a device that works for your use case. Fast updates being important to you, I can see why you picked the Oppo/OnePlus device. I actually have come to like TouchWiz, so that means I wait longer. I’ve had it on my s8 since then also. Beta oreo was on both the 5t and s8. About the same time period. I liked the 5t but i prefer samsung pay and better camera. But hey, the 5t is a great phone. Well, I’ll try the new OS version. But the security level was already at February 1 from the previous minor update. The G950USQU2CRB9 just bootlooped the wifes phone. T-mobile. When will the Note 8 get it? False no update from T-Mobile.Its not even on they website. Why would you go to the website. Go to settings on your S8. Go to Software Update, and go to ‘Download Updates Manually’. I did the update last Saturday. It’s already available. You don’t have to wait for them to notify you. I went to settings and tried so many times.This is not my first Galaxy,also I was a beta tester..The roll out might be rolling out slow..
Hopefully this means the Note 8 won’t be too far behind. Manual check did gave me the update , went fast and it is working fine so far. As per Samsung’s prior M.O. (S7, anyone? ), the unlocked version is once again the red headed stepchild. The S6 & S7 never fook this long to update!!! Has anyone experienced a fast battery drain with the update? No, but battery life is not better, although that was supposed to be one of Oreo’s features. The update caused other problems for me though. Completely bricked my wife’s phone. The keyboard kept crashing. I had to factory reset it. Every damn update this happens. So sick of it. If your phone is bricked it would be dead and you couldn’t do anything to restore it. I think you might be using the wrong terminology. Seems to be fine on my S8+ so far, disappointed they removed the individual message tone option tho…. Working great on my S8. This T-Mobile OREO update is missing the new samsung keyboard GIF SEARCH function. WHY? We can’t search for GIFs useless. The unread email running count is wrong and it is not working. I got new message on Whatsapp and the running count is not showing up too. All these right after the Oreo update on my S8. Anyone else have this problem and how to resolve it?